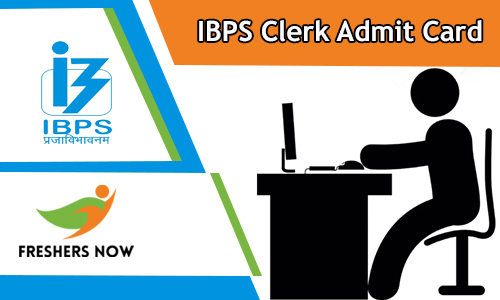 The IBPS Clerk Admit Card 2018 is available after the online application process was completed. Institute of Banking Personnel Selection is making arrangements to release the Admit card soon on its official website of IBPS i.e; www.ibps.in. The candidates who apply for IBPS Clerk Recruitment 2018 Notification can download their admit card when the officials release. Generally, the IBPS will conduct the Written Examination in two stages on the scheduled dates at the various examination centers. And the officials will release the IBPS Clerk Prelims, Mains Hall Ticket 2018 separately. For more information about the Call Letter, the candidates have to check this page regularly. The aspirants who are eagerly waiting for the IBPS CWE Clerk Admit Card 2018 have to wait for few days. IBPS conducts the Common Written Examination (CWE) for the job seeking candidates by releasing the recruitment notification. The aspirants have to face the various rounds of the selection process prelims and mains exam. Candidates who are going to appear for the IBPS Clerk Written Exam 2018 have to carry the IBPS Clerk Hall Ticket 2018 along with them. We all know that no aspirant will be allowed to give the exam without the Call Letter. So candidates who are commencing for the exam have to download the admit card before the date of the exam. The IBPS Clerk Admit Card 2018 will give the mandatory details about the written exam in a detailed manner. Usually, the Hall Ticket will release prior 15 to 20 days of the written exam. All the applicants have to download the admit card before appearing for the exam by giving the necessary details. To download the admit card the aspirants have to give the mandatory details like Registration Number and Date of Birth or Password. The candidates have to download the admit card in the online mode only. For no aspirant the admit card will send by Email or post. When the officials release the IBPS Clerk Prelims, Mains Hall Ticket 2018 will intimate the candidates by sending the Email and messages to download. By downloading the admit card the candidate has to verify the details printed on it. Are as per the application filled by them or not. On the IBPS Clerk Call Letter 2018, the aspirants can come across the details about the exam like Timing of the Exam, Center of the Exam, Date of the Exam, etc. Along with that, you can find the details of the applicant like Name of the candidate, Registration number, Roll Number, Model of the exam, fathers name, mothers name, signature, and a photo of the candidate. When the IBPS Clerk Admit Card 2018 is released we will update this page with the latest information for the sake of the candidates. The contenders have to begin their preparation for the IBPS Clerk Written Exam 2018 after downloading the admit card. To perform well in the exam the applicants have to go through the IBPS Clerk Syllabus 2018. IBPS Clerk Previous Year Question Papers will also help the candidates in their preparation. Before attending the exam the candidates have to verify the IBPS Clerk Admit Card 2018. On that, the aspirants can find the instructions to be followed by them while appearing for the exam. All the applicants should be at the time of reporting at the examination center. For any exam preparation being aware of the exam pattern is very important. The aspirants can get the IBPS Clerk Prelims, Mains Exam Pattern from this place. Both the IBPS Preliminary Exam and IBPS Mains Exam is an objective type and the paper will be in bilingually. Expect the Tes of English the other subjects will be both the English and Hindi languages. The preliminary exam consists of questions from various subjects such as 30 questions from the English Language for 30 marks. 35 questions will be of each subjects Numerical Ability, Reasoning Ability for 35 marks. The total exam is for 100 marks comprises of 100 questions. Time duration is 1 Hour. The Mains Exam comprises of questions from General/ Financial Awareness, General English, Reasoning Ability & Computer Aptitude, Quantitative Aptitude subjects. Each subject carries different marks, the different number of questions. The time limit will also vary for each subject. The Mains Examination consists of 190 questions for 200 marks. The duration of the exam is 160 minutes. For each question for which a wrong answer has been given by the candidate one fourth or 0.25 of the marks assigned to that question will be deducted as penalty. As per the rule of the organization, the officials of the Institute of Banking Personnel Selection will conduct the Preliminary Exam, Mains Exam, and Personal Interview. Candidates have to clear all the rounds to get the job as the Clerk. The IBPS will conduct the Written Examination for the applicants at various examination centers across India. The Tentative list of the Examination centers for the Preliminary Exam and the Mains Exam is available on the official website. Visit the official website of Institute of Banking Personnel Selection @ www.ibps.in. On the home page check for the “CWE Clerk” tab and click on it. The screen will appear with the latest clerk notification and click on the link. Now find out for the IBPS Clerk Admit Card 2018 link and hit it. The screen will display with the empty fields. Fill the filed with the required details and submit the form. Here the IBPS Clerk Hall Ticket 2018 will appear on the screen. Finally, take a printout for the future use. Hope the candidates are satisfied with the stuff related to the IBPS Clerk Admit Card 2018. For more latest updates visit our website Freshers Now frequently.